On this day in history, Jan. 14, 1889, Congress approved “An act for the relief and civilization of the Chippewa Indians in the State of Minnesota.” Not surprisingly, that’s a euphemism. The act did not provide relief. Quite the opposite, it violated treaties, forced assimilation, and stole Native lands. This 1889 act is commonly referred to as the Nelson Act, after Minnesota Congressman Knute Nelson, its primary mover. He would go on to become a Minnesota Governor and U.S. Senator. 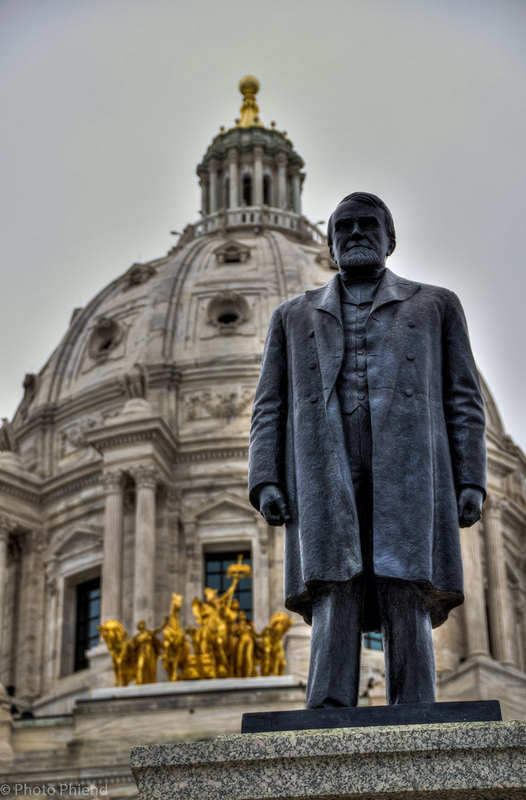 Though most people probably don’t know it, Nelson holds a place of honor at the Minnesota State Capitol; his statue is on the front steps overlooking the Capitol mall. Nelson’s statue was installed in 1928. I’d bet you could stop people on the Capitol steps and few would be able to name Nelson let alone know anything about him. That seems like high praise, until you ask yourself, “What were the principles in which he believed?” Apparently it was not the Rule of Law, but Might Makes Right. Congress passes the Dawes Act in 1887, which, combined with the Nelson Act two years later, allots 80 acres of non pine land, within the boundaries of the reservation, to each tribal family. The remainder of the non-allotted Indian lands were then opened up and sold or granted to timber companies, railroads and settlers. With the passage of the Nelson Act, loggers were able to move onto the land, and within a couple of years clear cutting was in full progress. It should be noted, that with the passage of the Nelson Act, the state of Minnesota now claimed that tribal members were now subject to state hunting and fishing laws. No longer could tribal members hunt, fish, or gather on the Leech Lake Reservation as promised by the numerous treaties they had previously negotiated. Another unforeseen problem was, allotments were to be held in trust for twenty five (25) years, upon which, Indians were then given a fee patent. As a result, most Indians lost their allotments through tax forfeitures, sales and/or fraud. 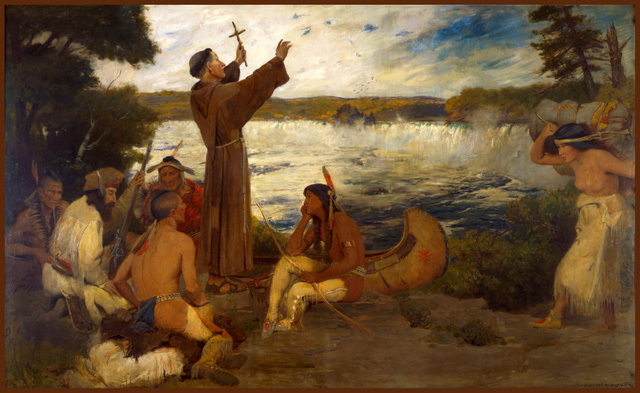 This painting of Father Hennepin — an image of Manifest Destiny — used to hang in the Governor’s Conference Room; it got moved. It’s time to move Knute’s statue, too. To summarize, the Nelson Act had three profoundly negative effects on the Anishinaabe people. Forced Assimilation: The Nelson Act undermined Anishinaabe culture and lifeways by moving for communal ownership of land to individual ownership. Direct Land Theft: It created an artificial notion in law of “excess land” on reservations, an effort to steal land by caveat, a blatant treaty violation. Indirect Land Theft: Forcing individual land ownership made it easier for white settlers and businesses to buy it from impoverished Anishinaabe peoples, something they couldn’t do if the land was communally held. Given Nelson’s legacy, is he still a man we want to honor with a statue such an important space? There are good reasons to preserve history so we don’t forget it, but could we move this statue somewhere else where it could be properly interpreted? What does it say to the Anishinaabe people that this man has a place of honor at the Capitol? State leaders recently decided to remove or relocate some of the most offensive art inside the Capitol). However, that review did not include the Capitol Mall and statues, including a review of the Nelson statue. Sadly, one expects that any effort to de-Knute the Capitol steps would raise an uproar, just as happened when people pushed for removing the Father Hennpin painting from the Governor’s Conference Room to a less prominent location. That conversation around the Capitol Mall statues needs to happen. It’s time to move the Nelson statue somewhere else and find new more inspiring and inviting art for the Capitol’s front door.